The resort market is thriving, with buyers always at the ready. If you’ve got a resort to sell, your problem won’t be finding a buyer, but attracting the best buyer, for the highest return on your investment. In order to do that, it’s important to arm yourself with accurate information and put a real estate pre-development plan and marketing strategy in place that will appeal to your target market. Know your property’s worth. Determining the current value of your resort means taking into account your assets, current, and future earning potential, cash flow, and development potential. It’s wise to have a third party evaluate the property, and prepare a market analysis, to inform you of your property’s strengths and weaknesses, as well as providing important information for potential investors. Design the right product and amenities. A thorough assessment of your target market is necessary to ensure that you’re building the desired product type and amenities for future buyers. Depending on the property location and buyer profile, resort buyers may desire villas or casitas, or luxurious condominiums. The proper planning of resort amenities is also critical, from spa services, dining, a pool and other outdoor recreational areas to five-star concierge services, and more. Consider offering a “discovery experience.” More and more, developers are offering a “try before you buy” opportunity to potential buyers, providing them with a stay on the property they’re considering purchasing. 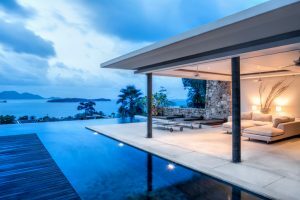 Even if your resort is still in development, this can be an interesting tactic, because by setting up luxurious temporary structures can give your prospects a taste of what future guests would experience. This kind of glamping experience has proven successful for resort developers, some of whom charge thousands of dollars for the opportunity to indulge in this experience. Partner with an experienced marketing and sales team. There is a lot that goes into marketing and selling a resort. Choosing an outside marketing company to help you sell your property is a smart move because while you are close to the project, a third party can look at it objectively and analytically. The right team can develop a property marketing and sales strategy that generates results and maximizes your ROI. Whether your focus is resort or urban real estate development, SagePoint has the knowledge and tools to keep you at the forefront of the industry, with the professional marketing, sales and advisory services you need to stay on top. When we’re part of your project from the very start, you can expect your property to be positioned, designed and built to target your market and maximize your returns. To learn more about our services, please contact us online or email us at inquiries@sagepointre.com.